Will Maine end a bombastic reign? Medicaid coverage, along with Governor Paul LePage’s temperamental style, is weighing heavily on voters’ minds. 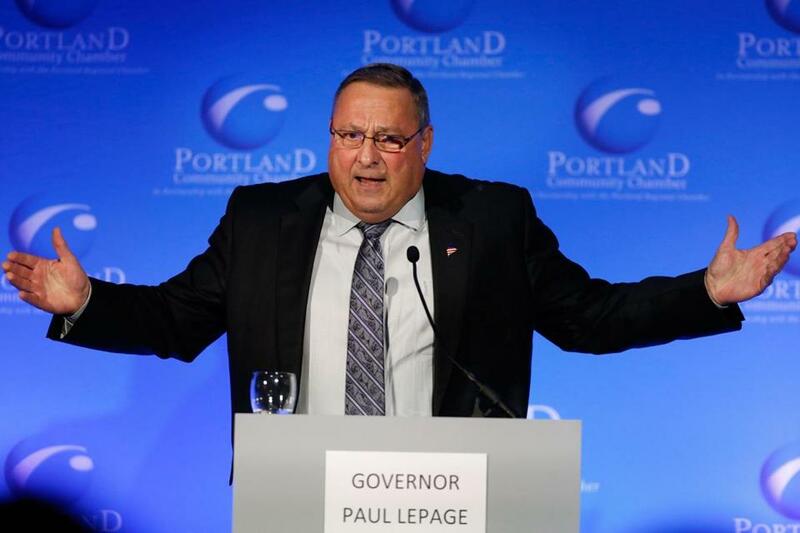 Republican Governor Paul LePage, Maine’s pugnacious CEO, has frequently found himself in the headlines for bombastic, and sometimes crude, comments. But his most interesting remark in the first couple of gubernatorial debates seemed to carry an undertone of reflection and even regret. Offering a closing statement at a Chamber of Commerce forum on Wednesday, LePage brought up a super PAC ad that referred to his divisive governing style and controversial remarks and charged that he had embarrassed Maine. You expected one of two things: LePage would either declare that he’d say it all again or claim that he had been taken out of context. After the debate, a couple of us caught up with the press-averse governor as he hustled from the hall. Was his comment an acknowledgment that . . .
LePage was ready before the question arrived at its obvious conclusion. “It’s an acknowledgment that I am French,” he said. Not just that, but Maine’s first governor of French descent, which makes him unusual. And yet, the man with the best shot at beating him this fall is more unusual still. That’s Second District US Representative Michael Michaud, the first person of French descent to serve Maine in a federal office. If he wins, the former paper-mill worker would also be the first openly gay candidate to be elected governor anywhere in the United States. Michaud came out last fall, near the start of his campaign, as a way to move beyond the whispering. It’s a credit to Maine that his sexual orientation really hasn’t been an issue beyond adding an unexpected dimension to a congenial meat-and-potatoes politician who after high school went to work rather than to college. Michaud, who hails from East Millinocket, about 65 miles north of Bangor, has been statistically tied with LePage in most of the recent polling. Still, though LePage is thought to have a hard ceiling in the high 30s or low 40s, he also has a path to victory. It’s the same one he traveled four years ago: a plurality win in a field where his two rivals divide the anti-LePage vote. The third candidate is independent Eliot Cutler, an owly, jowly, Harvard- and Georgetown Law-educated attorney who finished a close second in 2010, garnering 35.9 percent of the vote to LePage’s 37.6, with Democrat Libby Mitchell a distant third at 19 percent. This time, however, the one stuck in a distant third is Cutler, who conveys the sense of someone who believes his superiority as a would-be governor is so self-evident that it’s a little wearying to have to point it out. When I asked if he was shaping up as a spoiler in this year’s race, Cutler gestured at the stage where the three had just finished debating. There is far more on the line here than just personal style or intellectual or ethnic pride or identity politics, of course. LePage has repeatedly vetoed legislation to expand Medicaid health care coverage as allowed under the Affordable Care Act. The eldest of 18 children born to a poor Lewiston family headed by an alcoholic, abusive father, he came up the hard way, running away at 11 and relying on his own pluck and the kindness of strangers to survive. A Horatio Alger story, LePage, a Husson University graduate, sees a Medicaid expansion as more welfare rather than a big opportunity to increase health care in the state. Both Michaud and Cutler, by contrast, would expand Medicaid coverage. That issue, along with LePage’s temperamental style, is weighing heavily on voters’ minds. A number of Cutler fans told me they soon had to decide whether Michaud is the only one who can oust the irascible incumbent. Which is a message Michaud is working to reinforce. Talking to reporters after a Thursday debate at Thomas College in Waterville, the congressman didn’t take the bait when asked if he thought Cutler should drop out, but said that as election day nears, he thinks some Cutler voters will “jump ship” and support him. “They’re very nervous that they might have another four more years of this governor,” he said, pointedly. It’s hard for a candidate like Cutler to recognize that his moment has passed. But this state has a strong practical instinct and a palpable desire to turn the page. I’ll go out on a limb here. Mike Michaud is the next governor of Maine.